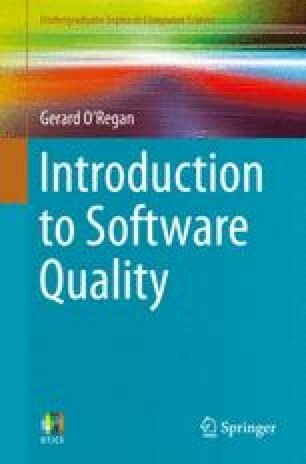 The objective of software inspections is to build quality into the software product, rather than adding quality later. There is clear evidence that the cost of correction of a defect increases the later that it is detected, and it is therefore more cost effective to build quality in rather than adding it later in the development cycle. Software inspections are an effective way of doing this. There are several approaches to software inspections, and these vary in the level of formality employed. A simple informal approach consists of a walkthrough of the document or code by an individual other than the author. The meeting usually takes place at the author’s desk or in a meeting room, and the reviewer and author discuss the document or code informally. The well-known Fagan inspection process was developed at IBM in the 1970s, and it provides a rigorous approach to building quality into the software. The majority of defects (e.g., 80 %) will be detected by software inspections in a mature software company, with the remainder detected by the various forms of testing conducted in the organization.